Television content is regarded as a vital component of Europe's heritage, collective memory and identity - all our yesterdays - but it remains difficult to access. EUscreen project aims at the creation of a representative collection of television programs, secondary sources and articles permitting in this way access to students, scholars and the general public. The main use cases for this content inlude learning, research, leasure and creative reuse. The lod.euscreen.eu/resource/ pilot is an initial attemp of making the EUscreen content availiable as Linked Open Data on the web. It allows users not only to access and retrieve metadata from the EUScreen content,via standard Web technologies, but also to discover relevant data within the multitude of the available content and even to implement applications that integrate data from EUScreen collection. 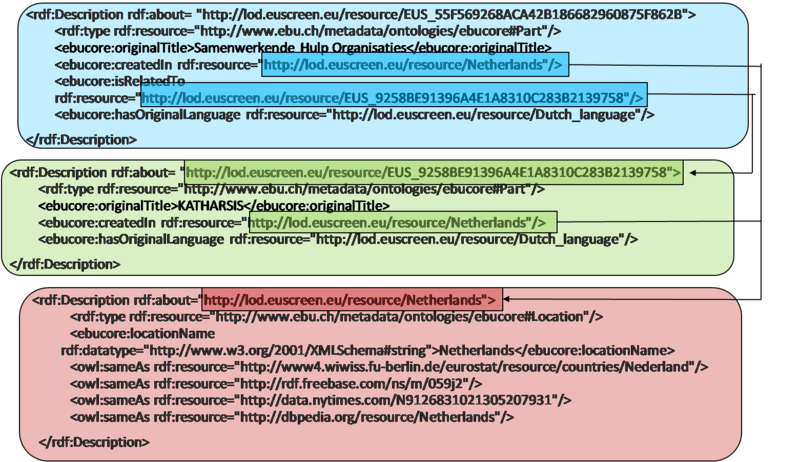 The data is represented using the EBU Core ontology and the described resources are addressable and dereferencable by their URIs - for instance, http://lod.euscreen.eu/resource/EUS_55F569268ACA42B186682960875F862B leads either to an HTML page on the EUscreen portal for the object it identifies or to raw, machine-processable data on this object. Disclaimer: lod.euscreen.eu/resource/ is currently in pilot stage, and can thus be changed at any moment! Your feedback is more than welcome, and may lead to updates in the prototype service. The multidisciplinary nature of the EUscreen project is mirrored in the composition of the socio-technical nature of the consortium; comprising of 20 collection owners, technical enablers, legal experts, educational technologists and media historians of 20 countries. Content Provider Virtual Exhibitions: Each content provider selects content supported with other digital materials and textual information on subjects or topics of their own choosing (20 % of content). lod.euscreen.eu/resource/ currently contains metadata on 12.165 videos that reflect the EUscreeen's content selection policy. The data served by lod.euscreen.eu/resource/ is generated from the metadata EUscreen has harvested using the MINT ingestion platform. 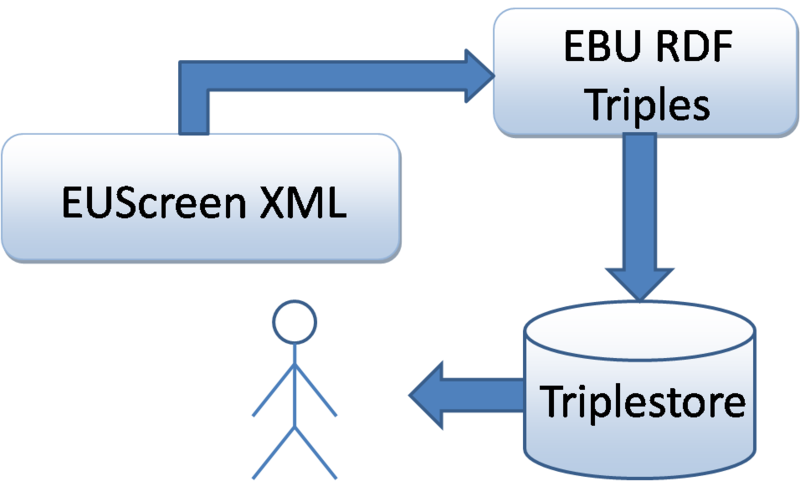 More specifically, the providers mapped their metadata using MINT to a harvesting XML schema that was implemented based on EBUcore (an established standard in the area of audiovisual metadata) to achieve interoperability between colections. In order to publish this data as Linked Data, we have converted it to the Resource Description Framework (RDF) format, and structured it using the EBU Core ontology. More specifically the procudure followed is illustrated in the figure below. We have implemented a mapping of all the harvesting schemas's elements to classes and properties of the EBU Core ontology. Therefore every provider's instance that has been transformed according to the harvesting schema, is also transformed to an RDF file. This file is then stored in a triplestore repository (the triplestore used is 4store) from where the users can consume data using SPARQL. internal links to other videos that are also served by lod.euscreen.eu/resource/. semantic enrichment done by NTUA, connecting EUscreen videos to structured representations of places and languages. The following schema illustrates an excerpt of the resources and the way that they are linked. The data can also be consumed through the http://lod.euscreen.eu/sparql sparql endpoint or by using the web interface of the 4store repository. Any question, positive feedback or criticism is highly encouraged! Please email us .